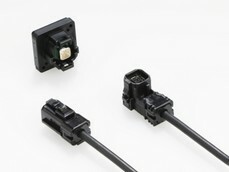 JAE has released a new 22 position plug connector for cable harness applications. The transmission characteristics of this product have been improved by removing two of the center terminals (pin B6 and B7) for standard USB cable assemblies and accessories which do not use these two terminals. In addition, a cut-out area on both sides of the shell ensures improved retention to the paddle card used in cable harnesses. JAE has developed the industry’s smallest-in-class waterproof coaxial connector compatible with the standard FAKRA interface, the MX66 Series, for use in applications such as ADAS and connected cars. This product supports high-frequency transmission up to 3GHz (depending on implementation) and is available in different keying options conforming to the FAKRA standard. JAE has developed the MX67A Series, high pin count and miniaturized connector for automotive airbag ECUs. In order to improve automotive safety, there has been importance placed on the introduction of safety features to protect not only the passengers and pedestrians, but also the complete running vehicles. To comply with this trend, airbags are being installed in various areas of vehicles such as on the side, the rear seats, and more. JAE has developed a straight receptacle to add to the variation of the BNC0 Series line-up. The BNC0 Series is a coaxial connector with superior mounting feature and high-frequency performance, compatible with 12G-SDI (SMPTE ST-2082 1), which is ideal for 4K uncompressed transmission. It will cater to a wide range of applications along with our existing right angle receptacles. JAE has developed the miniaturized MX79A Series connectors for high-speed transmission between in-vehicle information and communication technology (ICT) units such as camera ECU. The MX79A Series is ideal for use in combination with our automotive camera connector MX55J Series, with the MX79A Series supporting the ECU side connections. It achieves a 30% reduction of mounting space compared to our MX49A Series. JAE has developed the MX55J Series high-speed transmission connectors for in-vehicle digital camera systems to support new technologies such as ADAS and autonomous driving. The MX55J Series is compatible with 1.5Gbps class video signal (LVDS) differential transmission and the rear case camera connector has been minimized to the standard in-vehicle camera size 23mm x 23mm. JAE has developed and launched of the USB 2.0 compatible MX45M Series interface connector for in-vehicle infotainment. The MX45M Series enables access to data stored in personal electronic devices through a USB 2.0 connection. The MX45M Series is compatible with cables for various portable devices. 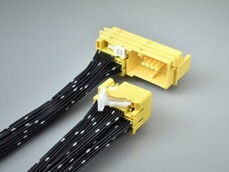 This product is sold only as a cable harness product to ensure transmission performance and reliability, and is not provided as a single connector. JAE has developed the MX60A Series high pin count waterproof automotive connectors which are ideal for engine compartment applications. The MX60A Series waterproof multipole automotive connector meets the optimum number of positions from 94 positions to 177 positions depending on the customer's application, by changing the combination of the parts. The cable exit can be set in four directions by changing the harness cover. Variation of USB Type-C™ DX07 Series Connectors has been expanded with the addition of VR Standard VirtualLink™ Compatible Products. JAE has developed and launched two types of receptacles; one is a center height 3.4mm hybrid type compatible with the VR market next-generation standard "VirtualLink", and another is an improved version of the most common USB Type-C specification two row SMT on-board type. JAE has developed and begun production of the KN02 Series, an all-plastic rectangular connector. The KN02 Series is an ideal interface for industrial equipment, such as robotics, automated machinery and machine tools. The KN02 Series is an all-plastic combo-type rectangular connector with an EMI countermeasure. The all plastic shell allows the connector to be lightweight while providing an enhanced shielding performance with a metal plating on the outer plastic shell. JAE has developed the KW03 Series cable connector compatible with medium-speed chargers and the V2G system. This product is intended for use by general users and is designed with easy operation and safety in mind. The grip has been ergonomically designed for ease of handling and it achieves intuitive single-action operation. Weather and flammability resistant resins are used for the outer shell allowing for a lighter and stronger connector. JAE has launched a waterproof USB Type-C receptacle to add to the DX07 Series line-up. 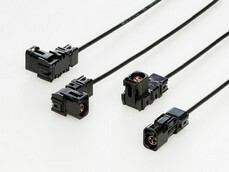 The "DX07 Series" family consists of Type-C receptacle connectors, plug connectors, and cable harnesses. The product achieves waterproof performance by adopting a unique design and insert molding process. As a result, the product has a highly reliable waterproof structure to satisfy IPX8 even after the reflow process. JAE has developed the MX68 Series connectors for high-speed transmission between in-vehicle information and communication technology (ICT) units. The MX68 Series is compatible with 4.8Gbps class LVDS / GVIF differential transmission (depending on configuration and usage). The mounting method is through-hole reflow, and the mounting area is reduced by about 26% compared with our conventional products. JAE has developed and released a USB Type-C cable harnesses which has a thumb screw integrated in the plug hoods to allow for secure mating in industrial applications. It will be made available to customers as part of the "DX07 Series" family of products which also includes standard cable harnesses without screw locks, as well as receptacle and plug connectors. JAE has developed the HB03 Series compact cable in-line connector for easy cable wiring. This connector series caters to a wide variety of industrial equipment, such as robotics and automated machinery. JAE has developed the HB03 Series compact in-line connector which is ideal for threading cables through limited spaces efficiently. The connector features a sophisticated one-touch lock mechanism where the locking tab does not protrude from the connector, maintaining the space conscious design. JAE has developed the MX65 Series, European standard HSD-compatible connector for high-speed transmission between in-vehicle information and communication technology (ICT) devices. This product features a double-sided lever spring structure for the locking portion, which increases reliability of the lock and reduces the occurrence of deformation of the locking area. The pin-side in-line connector is designed so clips can fix the cable harness to the body. 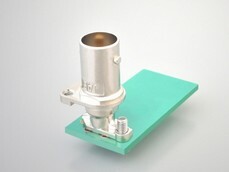 JAE has launched a right angled receptacle BNC coaxial connector with superior mounting feature. This connector has a high-frequency performance, compatible with 12G-SDI (SMPTE ST-2082 1), which is ideal for 4K uncompressed transmission. This high-frequency coaxial connector delivers 4K/8K video signals through a single channel and can be used in broadcasting, A/V, measuring equipment, network cameras and medical equipment. JAE has developed the JN2V Series small circular, one-touch locking waterproof connector ideal for servomotors and other various industrial equipment requiring environmental resistance. This plug connector enhances resistance against shock and vibration and provides stable contact performance even when applied loads exceeding what our conventional products can withstand. JAE has developed a board-to-cable connector MX77A Series for automotive ECUs. It is significantly smaller in size and lower in height than our conventional automotive products. In addition to its small size and low height, the product is designed to be compatible with SMT (surface mount technology). The MX77A Series is capable of meeting the various needs of customers by expanding the pin counts from 4 to 40 positions. JAE has expanded our D-sub Series lineup by introducing an anti-shock D-sub specifically to be used for medical devices, such as electrocardiography. In an electrocardiography machine, connectors are used to connect the main unit of the device to the lines lead to the patient. To prevent electric shock to patients, a new code, IEC60601-1: 2012 (8.5.2.3), has been implemented for medical devices as a safety standard. JAE has developed the "ST50 Series" UHS-II compatible push-push type microSD card connector for compact devices that require removable storage medium such as smartphones, cameras, tablets and notebook PCs. MicroSD cards are widely used as an external storage medium for compact devices to allow storage of large images and 4K video files, and also to install and run apps (applications) on smartphones. The DX07 cable harness is compliant with the USB Type-C and USB PD 3.0 specifications and supports up to 10Gbps USB SuperSpeed Plus communication and 5A max. power supply as well as USB PD 3.0 features such as EMIC low-voltage drive (3V). USB 3.1 Gen1 / Gen 2 and USB Power Delivery Revision 3.0 (hereinafter as USB PD 3.0) certified cable harnesses with a USB Type-C connector on both ends. JAE has developed the "JN14 Series" low-profile connector ideal for metal box casing type compact servomotors. This all-plastic connector provides a lightweight and low-cost solution. Catering to industry requirements, the "JN14 Series" utilizes a screw lock and low-profile mounting method, offering a highly secure IP67 waterproof connection. The connector was also designed to be easily mounted to the metal box casing of a servomotor. The "JN14 Series" line-up includes a 4-position connector for power, 2-position connector for brakes, and 9-positon connector for encoders. JAE has developed the "KW02 Series" CHAdeMO protocol compliant V2H (Vehicle to Home) system connector, which is highly durable, lightweight and provides superior operability. Recently the use of V2H system has begun; a system where utilizing the large-capacity of electric vehicles as renewable energy storage batteries to level energy demand into homes and office buildings. CHAdeMO is a brand name of the fast charger protocol proposed as a standard specification by the CHAdeMO Association. The SF78 Series is a slim and compact dual nano SIM card connector that can install two nano SIM cards in one connector, and contributes to space saving for the mobile device design.It features a mechanical lock structure that holds the SIM card tray in place without falling out in case the device is dropped. The SF78 series also has a structure that prevents SIM card tray mis-insertion and contact breakage during SIM card tray insertion and removal which helps to realize improved ease-of-use for the mobile device users. JAE has developed a 0.35mm pitch, 1.9mm width, 0.7mm mating height stacking type board-to-board connector, the "WP27D Series." It incorporates power supply terminals and a robust structure that prevents damage during engagement. The WP27D Series special hold-downs can be used as high-current power supply terminals and adopts a structure that prevents insulator breakage by adding protection to the mating surface with these metal hold-downs. Accordingly, improvement of durability against damage during mating is achieved. JAE has developed and started general sales of the DW07 Series connector, which was designed for busbar connection of devices requiring high-current power lines. This innovative docking style busbar connector was designed to improve commonly sought after space saving and operation time issues. This connector solution allows for internalizing high-density wires within devices, and reduce operation space and hours spent fastening down bolts by making tool-less connection possible. The DW07 Series is an ideal high-current connector. JAE has developed and launched 3 new types of receptacle connectors to add to the "DX07 Series" connector line-up, which is compatible with the next-generation USB Type-C specification. 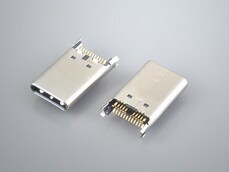 The USB Type-C connectors are expected to become widely used as a next-generation interface for smartphones, tablets, notebook PCs, televisions, gaming devices, and more with features such as compatibility with 10 Gbps high-speed communication, maximum of 5A and 20V power supply and reversible plug structure with no need to worry about the plug orientation. The KN01 Series waterproof connector is ideal for industrial equipment, such as robotics, automated machinery and machine tools, which require environmental resilience. In addition to the use of conventional large fixed machinery, use of compact lightweight production machinery that can easily correspond to system and layout changes based on the production situation is a growing trend. The KN01 Series is compact and lightweight with improved engagement operability, less wiring, and countermeasures against noise.